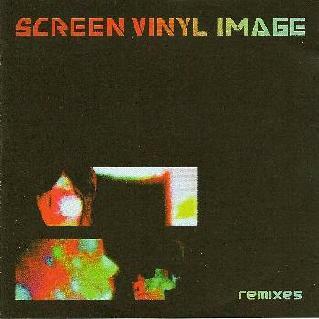 Screen Vinyl Image - "Remixes" / "Ice Station"
Hot on the heels of their remix project we have a new release from the DC based duo, which starts with two new studio tracks, the first of which is Siberian Eclipse: and it's in that bland depressive style that I hate to slag 'cause I don't know if it's a matter of taste, if it's been done better or just done to death... the icey-cold new-wave/goth/shoegazey style... the closest I can get to band comparisons would be perhaps Flying Saucer Attack meets Joy Division at times... simple programmed beats, keys, phased 'n' fuzzed guitar... the vox aren't exactly of the whisper or moan style, they're just... pretty plain. 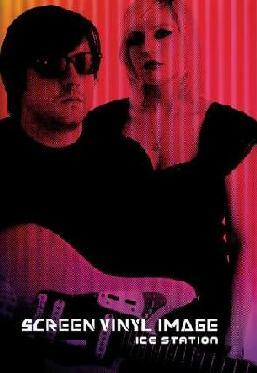 So go most of the tracks on this album... but now I can say some nice things: Such as the fact that the second of the new tunes New Visions is splendid - an upbeat catchy high-inducing spacer of a song! The next four cuts comprise the live set, one of which is Too Much Speed - a real beaut, this one has a nice feel, a happy tune, not unlike New Visions... and speaking of said tune, the live version might be even better than the studio - extended as it is they really get to chug the beautiful haze of the guitar and keys even further out into the cosmos, with added flange madness... stellar! The demo version of Siberian Eclipse has a lengthy ambient intro before the song proper, clocking in at ten minutes total... this intro is okay, they bend the wave-drones making it a bit of a queasy ride. The album concludes with a set of tunes from an '08 practice session, sounds like live in studio, but none of 'em float my boat, for the above stated reasons. Obviously the shining star is New Visions, so let's get more material like this, please!